I'm pleased to announce that we plan to partner with Hadley Rille Books as publisher of the proposed Aether Age anthology of short fiction based on the "shared world" plan that was elaborated on this blog during the summer. We plan to release the book in the summer of 2010. 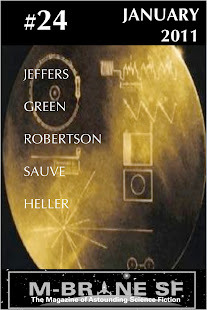 Hadley Rille Books was founded in 2005 by Eric T. Reynolds to publish science fiction with an emphasis on space, archaeology, climate and other science-related topics. Recently, Hadley Rille has also published fantasy titles and started a series of archeologically correct historical fiction. Having Hadley Rille as a partner in the project will expand the reach of this book and put M-Brane and its writers in the company of a great group of creators. Check back for further information over the next several days. I will shortly post new writers guidelines for the project with specific submissions dates. I will also add a dedicated page for Aether Age-related news and information, much as we have for Things We Are Not. I should add that when I say "we" in relation to this plan, I am including Brandon Bell who devised much of the architecture of the Aether Age world and will be closely involved with it throughout. That is fantastic news. I have two of his titles on my bookshelf already and they are wonderful. I expect good things to come from this venture. I am also looking forward to this. When I first started working with Chris roughly a year ago, I had always thought that he would be an individual that could publish some great books. It is fantastic to see this happening so quickly. Things We Are Not is an amazing first book. This new project will be something to indeed look forward to. I have been beavering away with an idea for it.